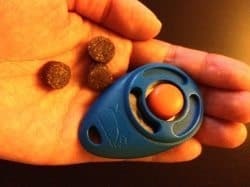 Clicker training is a training method where you use a click sound to tell your dog they have done something correctly. A clicker is a small plastic box that is held in your hand with a metal tongue that makes a click sound when you press it quickly. You will use this when your Rottweiler does something you asked them to do. This method of training has been used to train many other animals as well, such as cats, horses, rats, and birds. This device is used to give your words and cues meaning. It’s like creating a language that both dog and trainer can understand. What we want to accomplish with clicker training is an understanding that when your dog hears the click, they will know that they are doing what they are being asked to do. 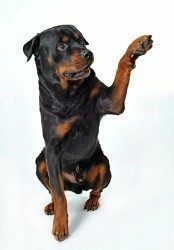 So first we need to get your Rottweiler to understand that when they hear the click, they get a treat. This will make them look forward to hearing the click sound, because they will know that it means they get a treat. The click sound is going to be a huge teaching mechanism. When your dog hears the click, they will think, “This is what I am supposed to do!” Once your dog understands that a click means they did what you asked them to do and now you get a treat, they will hear that noise and immediately associate it with getting a treat, making them want to perform the commands you ask of them so they get the reward. First you will want to make sure your dog understands what the click sound means. You can do this easily while you are just sitting at home watching TV! You will need to have your clicker handy as well as a box of treats. Put a treat in your hand and show your dog. They will immediately want the treat. Ignore them until they leave your hand with the treat in it alone. Go back to doing whatever you were doing. When you are ready, click the clicker and immediately give your dog the treat in your hand. Next, go back to what you were doing and wait a few minutes. At a random time again, click the clicker and immediately give your dog the treat in your hand. If you continue to do this, your dog will begin to associate the click sound with getting a treat. This makes the clicker a valuable training tool now! Your dog will begin to associate that sound with a reward. To make sure your clicker training is effective, here is a basic guideline to follow. Always be consistent in your training, and make sure your training sessions are not too long. Try to keep them under 15 minutes so your dog doesn’t get bored. Click the clicker once when your dog has done what you asked them to do. You will want to immediately follow the click up with a treat. It is important to be prompt with the click and treat delivery so your dog is not confused as to why they are hearing the click and getting the treat. So, for example, if you are teaching your dog to sit, as soon as their rear hits the ground, click the clicker and give your dog the treat. If you are teaching your dog several commands, make sure you only work on one at a time. So if you want to teach them sit, work on sit for 10 repetitions, have a play break, then move on to lay down for 10 repetitions. Repeat process with a short play break between sessions. This will ensure that your dog does not get confused during your training sessions. Always end your training sessions on a good note. If your dog is very good at performing a certain command, ask them to do that command at the end of your session so you can end your training for the day positively. They will have a great feeling of accomplishment. When training your Rottweiler, it is important to find a way to encourage them to perform the behavior. There are 3 basic ways to accomplish this: catching, shaping, and luring. You will need to decide which method works best for you and your dog and try to stick to that method to avoid complications. “Catching” is the method of catching your dog in the act of doing something you would like to teach them to do on command. Have your clicker and treats handy in your pocket and when you are sitting around your home with your dog, wait until your dog sits. As soon as they sit, click and treat. When they take the treat, they will most likely stand up, so when they are about to settle again, get ready, and as soon as they sit again, click and treat. You can do this every time you see them sit, lay down, or roll over. This is a great way to teach them these basic commands that your dog will normally do on their own on a normal basis. “Shaping” is the method of gradually building on a behavior. For example, if you are teaching your dog to raise their paw, as soon as they shift their weight to lift their paw, click and treat immediately. Then gradually work on waiting longer to click and treat until they are lifting their paw up all the way and placing it into your hand. When they finally do the command perfectly, it is ok to give them an extra large reward for completing it exactly correct. This is a great way to get them to perform a command that may be difficult for them to learn. This way they are getting a reward for each tiny step involved and will help them to understand all these small steps they need to do to get to the final goal. “Luring” is the method of using the treat as a guide to get your dog to do what you want them to do. For example, if you are teaching “lay down,” you will place a treat in your hand and put it in front of your dogs nose. Move your hand down towards the ground and your dog’s nose will follow your hand and the treat. When they are successfully laying down, click and treat immediately. As you continue this method, you will notice that you will not necessarily have to go through the full motions of the “luring” technique and will find that you make smaller cues until you do not have to move your hand from in front of their nose to the floor, but just a small gesture of a downward motion with your hand. I find this to be the most effective method of getting your dog to perform over catching and shaping. Finally, you will need to decide what cues you want to use in your training for your ultimate goal. If you are already using the “luring” method to get your dog to perform, transitioning them to hand signals will be simple for you, since you are already using them. You can also use voice cues, which are simple to use. Simply say what you want your dog to do, and when they perform the command, click and treat. Timing is essential! It is important to use your cues before your dog has done the command, and to click and reward immediately so there is no confusion. You should now be ready to successfully start your clicker training! Keep your training sessions short so you or your dog doesn’t get bored. Start your training in a quiet and controlled place and gradually work up to places with more distractions to challenge your dog. Always be prompt with your click and treat rewards. You do not want to contribute to any unnecessary confusion. Only do your training sessions when you are in a good mood and have enough time to do a full 15 minute session. Never try training when you are stressed out or distracted.